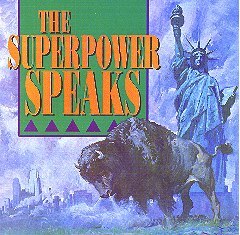 Restore >> Library >> "America Superpower" contents >> The Superpower Speaks (section 6) ..
ROMANISM IS NOW REGARDED by Protestants with far greater favor than in former years. In those countries where Catholicism is not in the ascendance and the papists are taking a conciliatory course in order to gain influence, there is an increasing indifference concerning the doctrines that separate the reformed churches from the papal hierarchy; the opinion is gaining ground that, after all, we do not differ so widely upon vital points as has been supposed and that a little concession on our part will bring us into a better understanding with Rome. It is true that there are real Christians in the Roman Catholic communion. Thousands in that church are serving God according to the best light they have. But Romanism as a system is no more in harmony with the gospel of Christ now than at any former period in her history. The Roman Church is far-reaching in her plans and modes of operation. She is employing every device to extend her influence and increase her power in preparation for a fierce and determined conflict to regain control of the world to re-establish persecution, and to undo all that Protestantism has done. Catholicism is gaining ground on every side. See the increasing number of her churches and chapels in Protestant countries. These things should awaken the anxiety of all who prize the pure principles of the gospel. The Roman Church now presents a fair front to the world, with apologies her record of horrible cruelties. She has clothed herself in Christlike garments but she is unchanged. Every principle of the papacy that existed in past ages exists today. The doctrines devised in the darkest ages are still held. Let none deceive themselves. The papacy that Protestants are now so ready to honor is the same that ruled this world in the days of the Reformation, when men of God stood up, at the peril of their lives, to expose her iniquity. As the Protestant churches have been seeking the favor of the world, false charity has blinded their eyes. They do not see but that it is right to believe good of all evil, and as the inevitable result they will finally believe evil of all good. Instead of standing in defense of the faith once delivered to the saints, they are now, as it were, apologizing to Rome for their uncharitable opinion of her, begging pardon for their bigotry. A prayerful study of the Bible would show Protestants the real character of the papacy and would cause them to abhor and to shun it; but many are so wise in their own conceit that they feel no need of humbly seeking God that they may be led into the truth. In the movements now in progress in the United States to secure for the church the support of the state, Protestants are opening the door for the papacy to regain in Protestant America the supremacy which she lost in the Old World. If the reader would know how papists and Protestants united will deal with those who reject their dogmas, let him see the spirit which Rome manifested toward the Sabbath in ages past. As the papacy became firmly established, the work of Sunday exaltation was continued. For a time the people engaged in agricultural labor when not attending church, and the seventh day was still regarded as the Sabbath. But steadily a change was effected. "Let all Christians remember that the seventh day was consecrated by God, and hath been received and observed, not only by the Jews, but by all others who pretend to worship God; though we Christians have changed their Sabbath into the Lord's Day" (Morer, pages 281, 282). Those who were tampering with the divine law were not ignorant of the character of their work. They were deliberately setting themselves above God. Records of the past clearly reveal the enmity of Rome toward the true Sabbath and its defenders, and the means which she employs to honor the institution of her creating. The word of God teaches that these scenes are to be repeated as Roman Catholics and Protestants shall unite for the exaltation of the Sunday. The prophecy of Revelation 13 declares that the power represented by the beast with lamblike horns shall cause "the earth and them which dwell therein" to worship the papacy—there symbolized by the beast "like unto a leopard." The beast with two horns is also to say "to them that dwell on the earth, that they should make an image to the beast;" and, furthermore, it is to command all, "both small and great, rich and poor, free and bond," to receive the mark of the beast. Revelation 13:11-16. It has been shown that the United States is the power represented by the beast with lamblike horns, and that this prophecy will be fulfilled when the United States shall enforce Sunday observance, which Rome claims as the special acknowledgment of her supremacy. "I saw one of his heads as it were wounded to death; and his deadly wound was healed: and all the world wondered after the beast" (Verse 3). The inflicting of the deadly wound points to the downfall of the papacy in 1798. After this, says the prophet, "his deadly wound was healed: and all the world wondered after the beast." Paul states plainly that the "man of sin" will continue until the second advent. 2 Thessalonians 2:3-8. To the very close of time he will carry forward the work of deception. And the revelator declares, also referring to the papacy: "All that dwell upon the earth shall worship him, whose names are not written in the book of life" (Revelation 13:8). In both the Old and the New World, the papacy will receive homage in the honor paid to the Sunday institution, that rests solely upon the authority of the Roman Church. Since the middle of the nineteenth century, students of prophecy in the United States have presented this testimony to the world. In the events now taking place is seen a rapid advance toward the fulfillment of the prediction. With Protestant teachers there is the same claim of divine authority for Sundaykeeping, and the same lack of Scriptural evidence, as with the papal leaders. The assertion that God's judgments are visited upon men for their violation of the Sunday-sabbath, will be repeated; already it is beginning to be urged. And a movement to enforce Sunday observance is fast gaining ground. History testifies of her artful and persistent efforts to insinuate herself into the affairs of nations; and having gained a foothold, to further her own aims, even at the ruin of princes and people. Let the principle once be established in the United States that the church may employ or control the power of the state; that religious observances may be enforced by secular laws; in short, that the authority of church and state is to dominate the conscience, and the triumph of Rome is assured. God's word has given warning of the impending danger; let this be unheeded, and the Protestant world will learn what the purposes of Rome really are, only when it is too late to escape the snare. She is silently growing into power. Her doctrines are exerting their influence in legislative halls, in the churches, and in the hearts of men. Stealthily and unsuspectedly she is strengthening her forces to further her own ends when the time shall come for her to strike All that she desires is vantage ground and this is already being given her. We shall soon see and shall feel what the purpose of the Roman element is. Whoever shall believe and obey the Word of God will thereby incur reproach and persecution. From the very beginning of the great controversy in heaven it has been Satan's purpose to overthrow the law of God. Whether this be accomplished by casting aside the law altogether, or by rejecting one of its precepts, the result will be ultimately the same. He that offends "in one point," manifests contempt for the whole law; his influence and example are on the side of transgression; he becomes "guilty of all" (James 2:10). The last great conflict between truth and error is but the final struggle of the long standing controversy concerning the law of God. Upon this battle we are now entering—a battle between the laws of men and precepts of Jehovah, between the religion of the Bible and the religion of fable and tradition. The Bible is within the reach of all, but there are few who really accept it as the guide of life. In rejecting the truth, men reject its Author. No error accepted by the Christian world strikes more boldly against the authority of Heaven, none is more directly opposed to the dictates of reason, none is more pernicious in its results, than the modem doctrine so rapidly gaining ground that God's law is no longer binding upon men. It would be far more consistent for nations to abolish their statutes, and permit the people to do as they please, than for the Ruler of the universe to annul His law, and leave the world without a standard to condemn the guilty or justify the obedient. Those who teach the people to regard lightly the commandments of God sow disobedience to reap disobedience. Let the restraint imposed by the divine law be wholly cast aside, and human laws would soon be disregarded. Clinging to the papal error of natural immortality and man's consciousness in death, they have rejected the only defense against the delusions of spiritualism. The doctrine of eternal torment has led many to disbelieve the Bible. And as the claims of the fourth commandment are urged upon the people, it is found that the observance of the seventh day Sabbath is enjoined; and as the only way to free themselves from a duty which they are unwilling to perform, many popular teachers declare that the law of God is no longer binding. Thus they cast away the law and the Sabbath together. The teachings of religious leaders have opened the door to infidelity, to spiritualism, and to contempt for God's holy law; and upon these leaders rest a fearful responsibility for the iniquity that exists in the Christian world. Yet this very class put forth the claim that the fast-spreading corruption is largely attributable to the desecration of the so-called "Christian sabbath," and that the enforcement of Sunday observance would greatly improve the morals of society. This claim is especially urged in America, where the doctrine of the true Sabbath has been most widely preached. As spiritualism more closely imitates the nominal Christianity of the day, it has greater power to deceive and ensnare. Satan himself is converted, after the modem order of things. He will appear in the character of an angel of light. Through the agency of spiritualism, miracles will be wrought, the sick will be healed, and many undeniable wonders will be performed. And as the spirits will profess faith in the Bible, and manifest respect for the institutions of the church, their work will be accepted as a manifestation of divine power. While appearing to the children of men as a great physician who can heal all their maladies, he will bring disease and disaster, until populous cities are reduced to ruin and desolation. In every place and in a thousand forms, Satan is exercising his power. He sweeps away the ripening harvest, and famine and distress follow. He imparts to the air a deadly taint, and thousands perish by the pestilence. And then the great deceiver will persuade men that those who serve God are causing these evils. The class that have provoked the displeasure of Heaven will charge all their troubles upon those whose obedience to God's commandments is a perpetual reproof to transgressors. It will be declared that men are offending God by the violation of the Sunday sabbath; that this sin has brought calamities which will not cease until Sunday observance shall be strictly enforced. Those who honor the Bible Sabbath will be denounced as enemies of law and order, as breaking down the moral restraints of society, causing anarchy and corruption, and calling down the judgments of God upon the earth. They will be accused of disaffection toward the government. Ministers who deny the obligation of the divine law will present from the pulpit the duty of yielding obedience to civil authorities as ordained of God. in legislative halls and courts of justice, commandment keepers will be misrepresented and condemned. A false coloring will be given to their words; the worst construction will be put upon their motives. The dignitaries of church and state will unite to bribe, persuade, or compel all to honor the Sunday. Even in free America, rulers and legislators, in order to secure public favor, will yield to the popular demand for a law enforcing Sunday observance. Liberty of conscience, which has cost so great a sacrifice, will no longer be respected. In the soon coming conflict we shall see exemplified the prophet's words, "The dragon was wroth with the woman, and went to make war with the remnant of her seed, which keep the commandments of God, and have the testimony of Jesus Christ" (Revelation 12:17). The people of God are directed to the Scriptures as their safe guard against the influence of false teachers and the delusive power of spirits of darkness. Satan employs every possible device to prevent men from obtaining a knowledge of the Bible; for its plain utterances reveal his deceptions. He is now putting forth his utmost efforts for a final struggle against Christ and His followers. The last great delusion is soon to open before us. So closely will the counterfeit resemble the true that it will be impossible to distinguish between them except by the Holy Scriptures. The whole system of religious principles and doctrines, which should form the foundation and framework of religious life, seems to be a tottering mass, ready to fall to ruin. Those who endeavor to obey all the commandments of God will be opposed and derided. In order to endure the trial before them, they must understand the will of God as revealed in His word; they can honor Him only as they have a right conception of His character, government, and purposes, and act in accordance with them. None but those who have fortified the mind with the truths of the Bible will stand through the last great conflict. God will have a people upon the earth to maintain the Bible, and the Bible only, as the standard of all doctrines and the basis of all reforms. The opinions of learned men, the deductions of science, the creeds or decisions of ecclesiastical councils, as numerous and discordant as are the churches which they represent, the voice of the majority—not one nor all of these should be regarded as evidence for or against any point of religious doctrine. Before accepting any doctrine or precept, we should demand a plain "Thus saith the Lord" in its support. God has given us His word that we may become acquainted with its teachings and know for ourselves what He requires of us. It is not enough to have good intentions; it is not enough to do what a man thinks is right or what the minister tells him is right. His soul's salvation is at stake, and he should search the Scriptures for himself. He has a chart pointing out every waymark on the heavenward journey, and he ought not to guess at anything. It is the first and highest duty of every rational being to learn from the Scriptures what is truth, and then to walk in the light and encourage others to follow his example. With divine help we are to form our opinions for ourselves as we are to answer for ourselves before God. The Bible should never be studied without prayer. The Holy Spirit alone can cause us to feel the importance of those things easy to be understood, or prevent us from wresting truths difficult of comprehension. It is the office of heavenly angels to prepare the heart so to comprehend God's Word that we shall be charmed with its beauty, admonished by its warnings, or animated and strengthened by its promises. Temptations often appear irresistible because, through neglect of prayer and the study of the Bible, the tempted one cannot readily remember God's promises and meet Satan with the Scripture weapons. But angels are round about those who are willing to be taught in divine things; and in the time of great necessity they will bring to their remembrance the very truths which are needed. The destiny of earth's teeming multitudes is about to be decided. Every follower of Christ should earnestly inquire: "Lord what wilt Thou have me to do?" We should now seek a deep and living experience in the things of God. We have not a moment to lose. Events of vital importance are taking place around us; we are on Satan's enchanted ground. Sleep not, sentinels of God; the foe is lurking near, ready at any moment, should you become lax and drowsy, to spring upon you and make you his prey. Copyright 1996 Family Heritage Books. Used by permission. The text of this magazine, written by Ellen G. White, was taken from The Great Controversy (subheads added).